Here's a question for you: if a kid answers a question with an answer that's clever, sassy, but technically correct, do they still earn the grade? Maybe they should. Don't we want our kids to be creative? To think outside of the box? 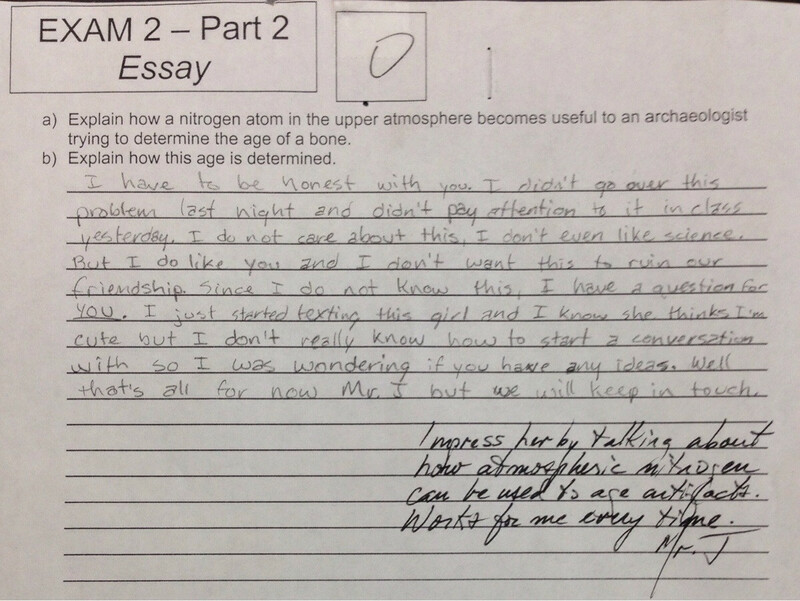 From inventing their own multiple-choice answers to pointing out the obvious, these hilarious test responses from students may not have sent them to the top of the class, but their parents should have gotten a good laugh out of them. We did! We consulted the Internet and moms to get the cheekiest, boldest, and funniest test responses from kids. Take a look at the slideshow below. We would be so embarrassed if our kid did #17. What would you do? Score a point for this kid. That's one humane answer. That's what the teacher was looking for ... right? Does the question really warrant further explanation? Poor Pauli just can't get accepted. Please be clearer next time, teacher. You really just can't unsee this one. "In second grade, my youngest would get these spelling sheets, it would have several sentences with a blank, student fills in the appropriate spelling word. Seems harmless right? "Well one sentence on one of those sheets was 'She _______ the baby into the cart.' My kid put 'dropped' in that spot. She dropped the baby into the cart. Her teacher and I agreed that maybe she shouldn't ever babysit. LOL." From the test taker's mom: "The queston reads 'Using place value, explain how to find the number 37 on this chart.' His answer was: 'I looked with my eyes and not with my mouth,' which is what we tell him when he's looking for something but won't put in the effort to find it so he says that he can't find it." Check out number three. "My son's attempt to spell impatient." Part science teacher, part advice columnist. Mr. J does it all. Sometimes the answer just doesn't appear! From this little "creative" speller's mom (who asked to have her name withheld! ): "I was SO embarrassed when my son's first grade teacher emailed me this photo of what he decided to spell during class. Let's just say, so far I haven't had any reports of bad spelling words in second grade. However, when the first list of spelling words came home this year and there were about six or seven extra lines at the bottom of it, he decided to write in his own words ... BLA, BLA, BLA, BLA, BLA." Sorry, teach, this one's completely on you. Well ... let's not discount all possibilities. Oh, oops, was that not an option? Yep, we're feeling pretty solid about this whole parenting thing, confident we're instilling valuable life strategies, etc.